(Note) Switching between current and voltage is accomplished by a switch on the bottom of the controller. (Note) These are the temperature characteristics of the linear output when the sensor head is connected. (Note) The judgment output and linear output and linear output response time is calculated by (Measuring cycle) x (Set average sampling rate + 1). Environmental resistance : Vibration resistance 10 to 150 Hz frequency, 0.7 mm 0.028 in double amplitude in X, Y and Z directions for 80 min. 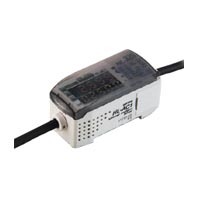 I/O cable extension Extension up to total 10 m 32.808 ft is possible, with 0.09 mm2 or more, cable. (Note) If the extension cable is longer than 10 m 32.808 ft, then it will not qualify for CE marking. Weight Net weight: 140 g approx.